Until the age of about 4 weeks old I raise my puppies next to my bed. During this time they get handled continuously.Generally at four weeks old they get their 1st innoculation. Thereafter I move them onto my lawn close to my back door so that they have easy access to the house all the time. Once outside my gardeners and I play with them regularly so that they can turn into stable and well rounded puppies. In addition to this I will often put them in my car for a quick trip down the road to the local café just to get milk or bread. In this way they are quickly trained as a litter to be used to going in the car and doing things with people. Housebreaking? Since they feed at the same time every morning and afternoon it is relatively easy to house train them. Directly after they have eaten we take them onto the lawn to do their business. In addition to this the puppies have access to the lawn all the time. Therefore in most cases the new owner will find that their puppy is very well house trained upon arrival. However, puppies will only have full control over their bowel and bladder at about 9 months of age and this you must keep in mind and plan for. I do not let a puppy leave my premises under 9 weeks of age. If I can have it my way I will only let puppies go between 10-12 weeks old. I believe it is criminal to rip a puppy away from its mother at 6 weeks of age. The mother still has a lot to teach the puppy. Don’t believe the untruths they tell you that you will get a puppy that bonds better with you and that it is easier to raise etc… These people do not have you or the puppies interest at heart. 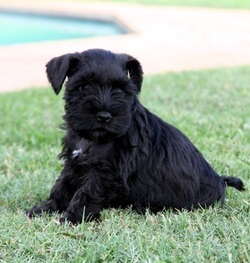 Taking a 6 weeks old puppy just increases your risk to have a Schnauzer with behavioural problems, full stop, no matter what anyone tells you. You are certainly not making it easier for the puppy or yourself. All you are doing is you are making it easier for the breeder since they do not want to look after the puppy for the next couple of weeks and most importantly …it costs money to feed, house them and effort to raise them. Please do not play Russian Roulette by getting a puppy at the wrong age, that is your option, chances are, you will have about 15 years to rue your decision. A puppy is an investment for the future, something to be treasured. 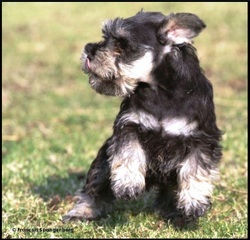 You need to think what is best for your puppy first and thereafter what will be good for you too. My suggestion? Do not fall in the trap of wanting to take a puppy at too young an age. This is the reason why I let a puppy go only after 9 weeks of age. . . Recent research has indicated that 8 weeks is a very crucial and sensitive time period in a puppy’s development. Integrating a puppy into a new enviroment at this age can have long-lasting negative consequences. All puppies have a fear period from about 8-16 weeks of age and then again from 7-8 months of age. (Many breeders/puppy farmers are not even aware of this critical time in a puppy’s life.)... That is a fact, we can not change it. Certain puppies deal better with this fear period than others. However we, as their “best friends” have to be prepared for this and ensure a happy transition to a mature and well-balanced Schnauzer. So in the end . . . A puppy is like an open book with neat clean pages, you decide what gets written in this book - good or bad. All your Schnauzer lives for is to please you. Tell him/her how to please you -it makes him/her happy too! 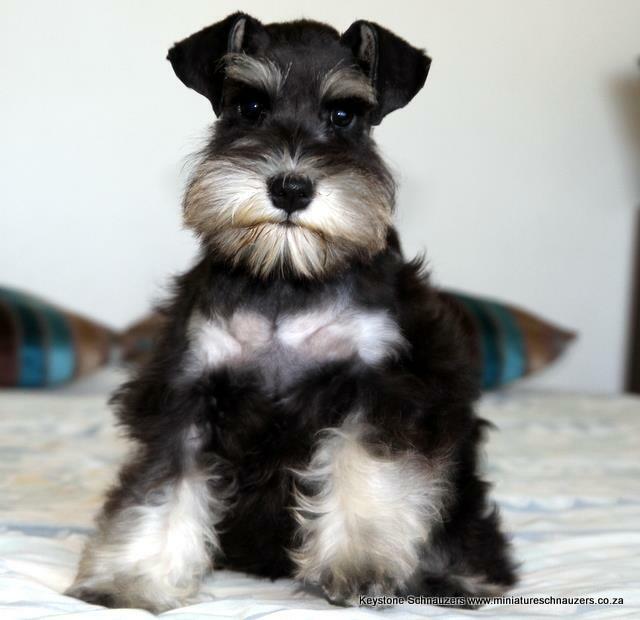 It is your job to raise your Schnauzer into a well balanced individual, one that is obedient, kind, controlled, gentle and above all a pleasure to be with. But how can he/her turn into this wonderful dog if you do not tell him/her or show him/her how? Do not fail your puppy in this regard! For if you raise your Schnauzie well, you will have the most wonderful companion ​ever.